“Command-and-control” managers of the past might have scoffed at current business research on happiness. Under their spans-of-control, employees ought to have been happy to have a job from which they derived an income. This view has been supplanted by widespread recognition that desirable outcomes like innovative problem solving, flexible decision making, and workplace productivity are associated with employees’ positive mood. Research by the Gallup Organization offers further justification in its finding that disgruntled employees disengage and cost the American economy up to $350 billion a year in lost productivity. Therefore, organizations can increase financial performance by improving operational efficiency in the many processes involving people. Sigal Barsade of the Wharton School of Business contributed to the investigation of happiness’s impact on organizational productivity. She found that positive moods prompt “more flexible decision-making, wider search behavior and greater analytic precision,” which enable the organization to take considered risks. On the other coast, Jennifer Aaker, award-winning professor at Stanford Graduate School of Business, links workplace happiness and a sense of meaning. She asserts that having a meaningful impact on the world is a strong predictor of happiness and that it’s possible to cultivate mindfulness and awareness of meaning in work and personal activities. This cultivated awareness, she said, influences people’s subjective well-being and may positively affect that of others in a contagion effect. 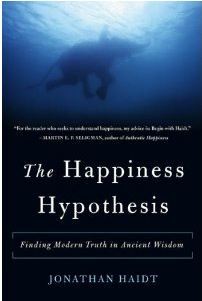 New York University’s Jonathan Haidt, a psychologist in the Stern School of Business, takes a more philosophical view of happiness. He redefines “wisdom” – other might say “leadership” or “self-management” – as the ability to adapt, shape the environment, and know when to move to new environments. Matthias Mehl of the University of Arizona offered an additional contributor to happiness: Interpersonal dialog. He found that volunteers who engaged in a meaningful conversation create shared meaning, strengthened their connections, and reported feeling happy. Peak, choosing experiences that inspire awe and a sense of the eternal, connect to families and communities. Increase involvement with others and the community. The payoffs to organizations include increased productivity, innovation and engagement. -*How have you seen efforts to increase organizational “happiness” result in improved employee engagement, productivity, or decision-making? This entry was posted in Resilience and tagged conversation, Decision making, Gallup Organization, happiness, Is-Is Not, Jennifer Aaker, Jennifer Michael Hecht, Jonathan Haidt, Matthias Mehl, Mindfulness, productivity, risk-taking, Sigal Barsade, well-being on March 6, 2013 by kathrynwelds. the distinction between *hygiene* factors (if not done right, will cause us to be dissatisfied) and *motivation* factors (challenging work, recognition, responsibility, and personal growth). Meaningful work is a leading motivator, and though Herzberg didn’t find as important a role by work relationships, this social support was a top predictor of work satisfaction, motivation and retention in Marcus Buckingham’s poll data in *First, Break All The Rules*. Thank you for mentioning that meaningful impact at work can often be derived from providing social support for colleagues. Though open-plan offices offer substantial cost-savings, the assumed benefits of collaboration may not be realized. More than a decade ago, Bill Gates asserted that the creative work of Microsoft engineers required the quiet and privacy of individual offices. This may be an impractical luxury for many organizations, but it is worth considering that different work demands require different environmental design. The trend toward “ROWE” – Results Oriented Work Environments may enable increasing numbers of employees to furnish their own work environments – at home. Pingback: DSNY Family » Are you happy with your job? Who Cares?